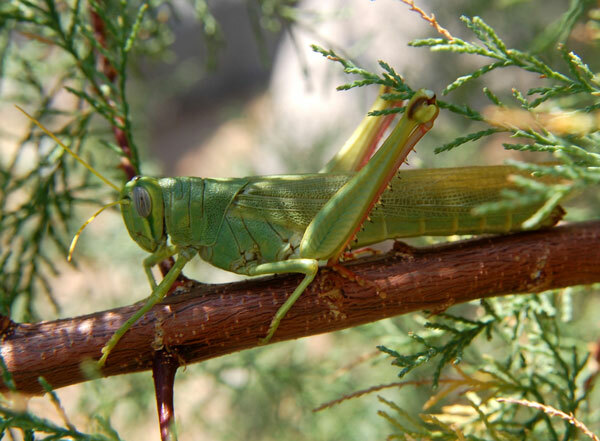 This Green Bird Grasshopper was photographed along Cave Creek, Maricopa County, Arizona, and was feeding on the leaves of Tamarisk/Salt Cedar (Tamarix pentandra). September 2008. This is among the largest grasshoppers in the Sonoran Desert. The lubber grasshoppers are bulkier but are more typical of southeastern Arizona habitats. Bird grasshoppers feed on a variety of plants and can sometimes strip plants when abundant. There is a prominent spur on the underside of the throat. With long wings these grasshoppers can sometimes take on long dispersal flights in search of food sources occasionally arriving in cities or farm fields in response to drying of their natural habitats.